The challenge was to design a piece that would function on both an aesthetic and a functional level, so that it would work primarily as a sculpture, and secondarily as a monumental sundial. 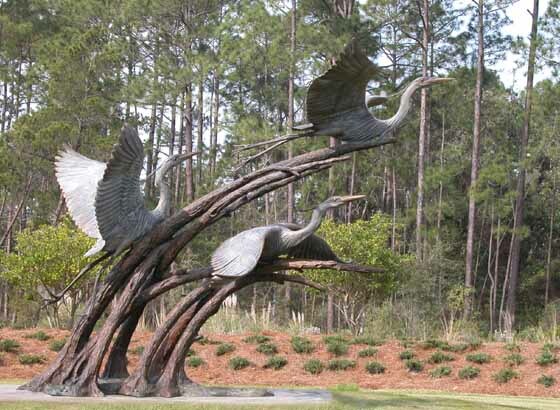 We wanted the trees to reflect the windswept character of the heron's coastal habitat while simultaneously angling away from the ground at roughly 30 degrees, so that the entire array formed the gnomon of a sundial with an elevation appropriate for its location at the Greg Norman Golf Course in Florida. It must be noted that it doesn't adapt to daylight savings time any more readily than many of us. The commissioned work resides in the center of a 40 foot rotary, but it would work quite well as a fountain piece, or as a focal point on an island either surrounded by water or plantings. A golfer in Lynn Haven Florida couldn’t stand it any longer. 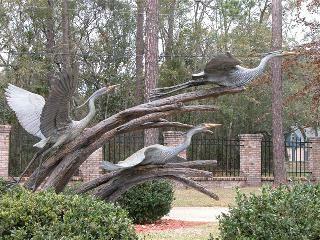 He drove by Greg Norman's monumental herons on his way to play golf nearly every day, and decided that a smaller version was going to have to take up residence in his yard. It did.